The state of Illinois’ Bicentennial Year draws to a close this Monday, Dec. 3 – the 200th anniversary of Illinois statehood – when concluding ceremonies will be held in the state’s capital of Springfield and in communities throughout the state. 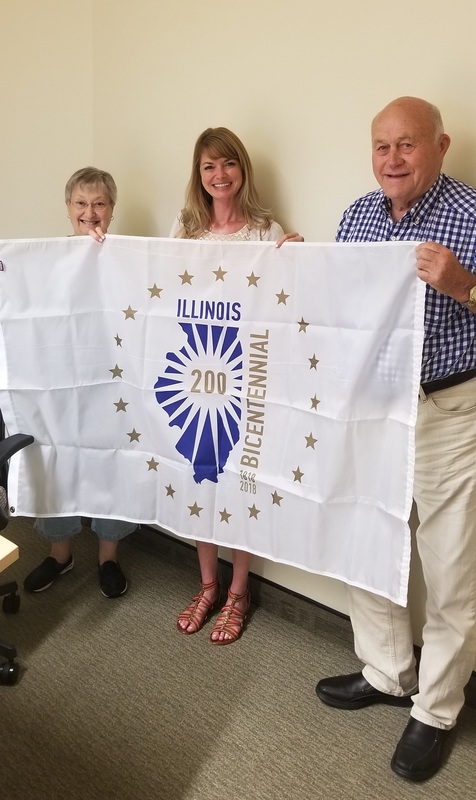 Pekin’s ceremony, during which Pekin’s Illinois Bicentennial flags will be lowered, will take place at 11:45 a.m. Monday on the Tazewell County Courthouse lawn. Over the past year, local festivals in Tazewell County have incorporated the celebration of the state’s bicentennial, with members of the Tazewell County Illinois Bicentennial Committee displaying a bicentennial banner and flying the bicentennial flag in parades during events such as the Tremont Turkey Festival, Mack-Ca-Fest, the Morton Pumpkin Festival, the East Peoria Festival of Lights, and the Hopedale Celebration. The final local festival during the Bicentennial Year will be the Minier Celebration on Saturday, Dec. 1, where Bicentennial Committee members will again participate. The official logo of the Illinois Bicentennial was officially unveiled at the Old State Capitol in Springfield on Jan. 12, 2017. The Pekin Public Library’s celebration of the Illinois Bicentennial will conclude Friday, Dec. 7, when the 12th and final video in the library’s Bicentennial Series will be shown at 11 a.m. in the Community Room. Since that day is also Pearl Harbor Day, the 30-minute video will be an oral history project called “World War II POW Stories,” in which former World War II prisoners of war tell of their experiences of war and being held captive by the enemy. Immediately following the video, at 11:30 am. in the Community Room popular local historian and writer Tara McClellan McAndrew will present “Becoming a State: the Illinois Way,” an informative and at times humorous program on Illinois’ road to statehood and the way Illinois’ legislators in Kaskaskia, the first state capital, crafted Illinois’ first state constitution and set up our first state government. Her program will last about an hour. For the concluding “From the Local History Room” column in our Bicentennial Series, we will take a look back 100 years and recall the celebration of the centennial of Illinois statehood in 1918. In December of 1918, Europe and the U.S. were holding Armistice talks in the aftermath of the end of World War I, and the Spanish Flu Pandemic was raging around the world and claiming the lives of anywhere from 20 million to 50 million people worldwide, including about 675,000 Americans. These facts cast a pall over Illinois’ Centennial celebrations – but the centennial was celebrated nonetheless. Pekin’s own Illinois Centennial celebrations consisted of a public assembly at 8 p.m. on Tuesday, Dec. 3, 1918, in the old theater of Pekin Community High School (the former West Campus). The gathering included music and singing – including a collective singing of the official state song, “Illinois” – as well as addresses given by former Illinois Gov. Charles Samuel Deneen (1863-1940), who had served as the state’s 23rd governor from 1905 to 1913, and former Illinois State Rep. James Frank Gillespie of Bloomington (1869-1954), who served in the Illinois General Assembly from 1913 to 1914. The organizers of Pekin’s celebration evidently sought to make the event bipartisan – Deneen, who is best known for putting down the infamous Springfield race riot of 1908, was a Republican, while Gillespie was a Democrat and later became a U.S. Congressman. The only mention of the Illinois Centennial in the Dec. 3, 1918 Pekin Daily Times was an inside-page brief. 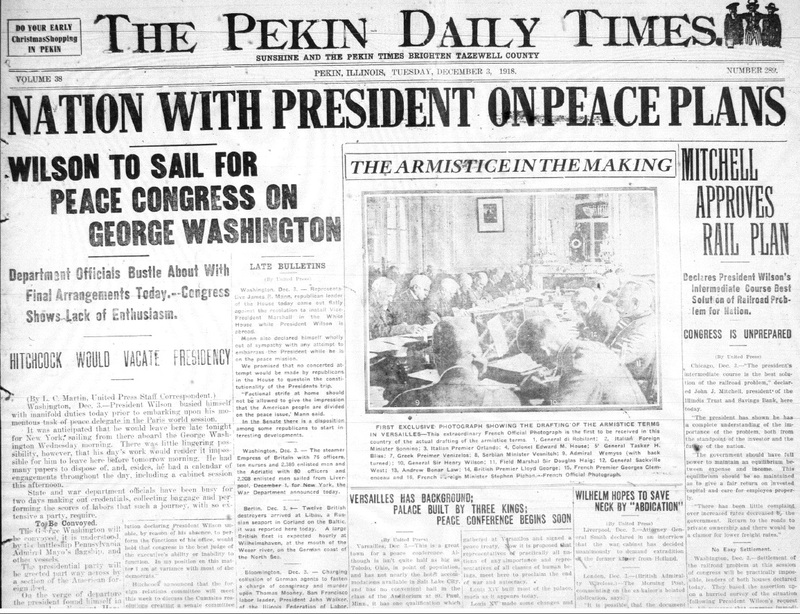 The centennial celebration was bumped from the front page by major news from Europe and Washington, D.C., regarding the Armistice talks at the end of World War I. 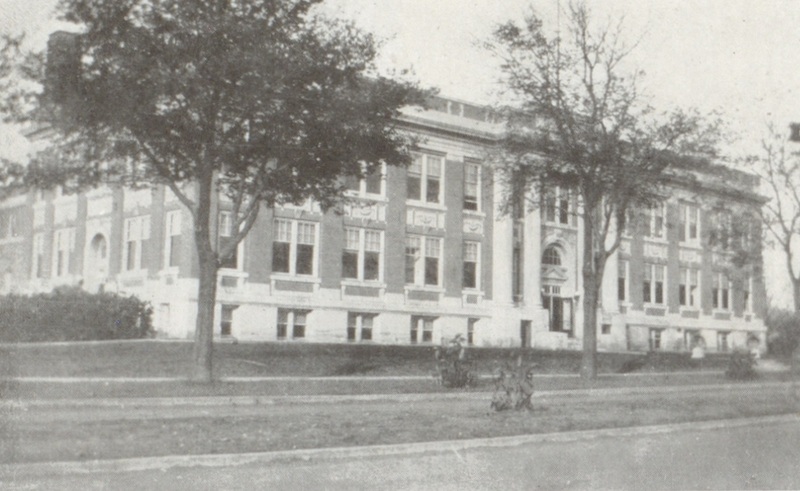 This photograph from the 1919 Pekinian yearbook shows Pekin Community High School as it was at the time of the Illinois Centennial in 1918. 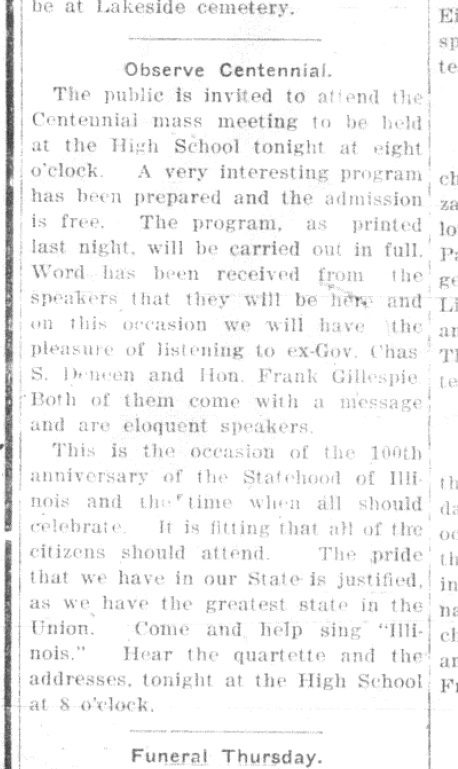 Pekin celebrated the state centennial with a community program at the high school theater on Dec. 3, 1918. The high school board members at the time were H. J. Rust, William Fair, A. Van Horne, F. C. Gale, and D. F. Velde. Our knowledge of Pekin’s celebration of the Illinois Centennial is, sadly, very limited, because several issues of the Pekin Daily Times from that week are missing. The issue of Dec. 3, 1918, is available in the library’s microfilms in the Local History Room – but, remarkably, the issues of Dec. 2, 4, and 5 have not been preserved on microfilm. Consequently, the only information on Pekin’s celebration on Dec. 3, 1918, that we can glean from the Pekin Daily Times comes from a single 26-line announcement, entitled, “Observe Centennial,” on an inside page of the Dec. 3 issue. That announcement makes reference to a published program of events that had appeared in the Dec. 2 issue, and no doubt a story about the Centennial program appeared in the Dec. 4 – but we cannot tell what was said about the Illinois Centennial in those issues. Furthermore, the announcement in the Dec. 3, 1918 issue of the Daily Times is the only item in that issue regarding the Illinois Centennial. Bigger news overshadowed the centennial in the Daily Times. The front page of that issue was filled with news of the Armistice talks in Europe, including a report on how the office of the U.S. Presidency would continue to function during the months that President Woodrow Wilson was in France for the talks. That issue of the newspaper also had a story on warnings from the U.S. Surgeon General’s Public Health Service regarding the persistence of the deadly Spanish Influenza – and, sadly, the paper that day ran a few death notices of infants and children who had succumbed to the flu – oh so common an occurrence in newspapers during those months. A century later, the old Pekin high school building where the state centennial was celebrated is no more, and Chicago with a population of 2,687,682 is now only the nation’s third largest city (after New York and Los Angeles) – but neither is the world today grieving for millions of lives lost and nations ruined in the immediate aftermath of an unprecedented global war, nor harrowed by a worldwide pandemic, nor are Illinois’ major cities today racked and crippled by cruel race riots. For all the troubles and challenges that the people of Illinois face today, life in Illinois in 2018 is still safer, healthier, and more prosperous than it was in 1918. As Illinois endured its troubles and faced its challenges in 1918, it can do the same in 2018. If Illinois is around for its Tricentennial in 2118, we may hope that generation will look back in gratitude and with wisdom for the state’s achievements and failures of the previous century. This is a reprint of a “From the Local History Room” column that first appeared in December 2014 before the launch of this weblog, republished here as a part of our Illinois Bicentennial Series on early Illinois history. When much of Illinois was still a wilderness, what did Tazewell County’s pioneers do for money? In their first years after arrival, the pioneer settlers didn’t use money, but instead relied on barter. Before long, however, they were able to make use of the rudimentary makings of a monetary and banking system. In his 1905 “History of Tazewell County,” pages 870-872, Ben C. Allensworth provides an account of the development of the county’s financial system (which tracked closely with the development of the state’s and the nation’s financial system). Allensworth then cites Charles C. Chapman’s 1879 “History of Tazewell County” for his information on the county’s first bank, the Shawneetown Bank, founded in Pekin in 1839 as a branch of the Bank of Illinois. Col. C. Oakley was the bank president, Charles A. Wilcox was the cashier and William C. Docker was the clerk. The Shawneetown Bank “had but a short run and closed its doors in 1842, because of the collapse of the great improvement system, inaugurated about this time by the State of Illinois,” Allensworth says. As we have noted previously in this column, the mansion of Gideon H. Rupert (1799-1877), which he built in 1862, was for a long time the location of Henderson Funeral Home, while James Haines (1822-1909) was a younger brother of William Haines, one of the co-founders and original plat-holders of Pekin. “It is from Mr. Haines we get the most information as to the methods and practices of the first bankers of Tazewell County,” Allensworth says. “We had no regular banks of issue in Tazewell County until the National banks were organized. Some of our older citizens remember that there was current money issued by a bank called the ‘Prairie State Bank of Washington,’ some time before the War, but the writer has been unable to get reliable information as to this. “There was reported an incident as occurred at the counter of this bank at this time, which was characteristic of those days. A certain Doctor came to the bank and is said to have deposited $200 in gold. A short time after he wished to withdraw his money, when he was offered the paper issue of the bank for his demand, which he refused to take, demanding gold instead. “It is said, the doctor, to end the altercation, drew his pistol and compelled the payment of gold . . . .
“Banks of issue of other States, and of cities of our own State, flooded the country with currency of doubtful value. This currency was mostly based on State bonds, and the less valuable these securities were the more profitable it was to circulate the currency based on them. “Southern and Eastern banking associations would send their currency into the West for circulation, as far away from home as possible, that it might not be returned for redemption so easily. . . .
“This currency of ante-bellum days, based on securities of fluctuating value, was more or less discredited in different parts of the country, often depending on the distance it was from its place of redemption, but more frequently because of the changes of the market value of the State bonds on which these issues were based. . . .
“But the people grew tired of these constant changes in the value of their money and refused to use it longer. The currency became so obnoxious to the people that they came to designate it by such names as Wild Cat, Red Dog and still more opprobrious titles. “It was at this time that the banking firm of G. H. Rupert & Co. did the people of Pekin and vicinity a great service. All our currency had become more or less discredited, and yet the people must have money to facilitate their transactions in business. G. H. Rupert & Co. adopted as their own issue the currency of the Platte Valley Bank of Nebraska, guaranteed on each bill put out by them, and thus relieved the stress for a good currency in Tazewell and surrounding counties. “This was a very courageous act, and the approach of the Civil War, with its resultant crashes in all business enterprises, tested to the breaking point the credit of this banking firm. Was there something fishy about Illinois’ nickname? Once upon a time, back in the Age of the Mississippi River Steamboat, there was a packet steamer that was named after the state of Illinois. The boat, a side-wheeler, was designed and built in Pittsburgh, Pa., by Capt. Richard C. Grey, superintendent of construction of the Northern Line. She was a 523.77 ton vessel, 230 feet long, 36 foot beam, with a 5 foot 5 inch hold. Designed for speed, her cylinders were 22 inches in diameter and she had a 7-foot stroke, which is what made it possible for her to set a record in 1867 for the 700-mile run from St. Louis, Mo., to St. Paul, Minn., making it in just 69 hours and 48 minutes. Along with a sister steamer named after the state of Iowa, she was launched in 1860 and plied the waters of the Upper Mississippi for 12 years. Since her sister ship was named after the state of Iowa, her sister was christened the Hawkeye State. And since she herself was named after the state of Illinois, she was given the name Sucker State. No, really, that was her name. 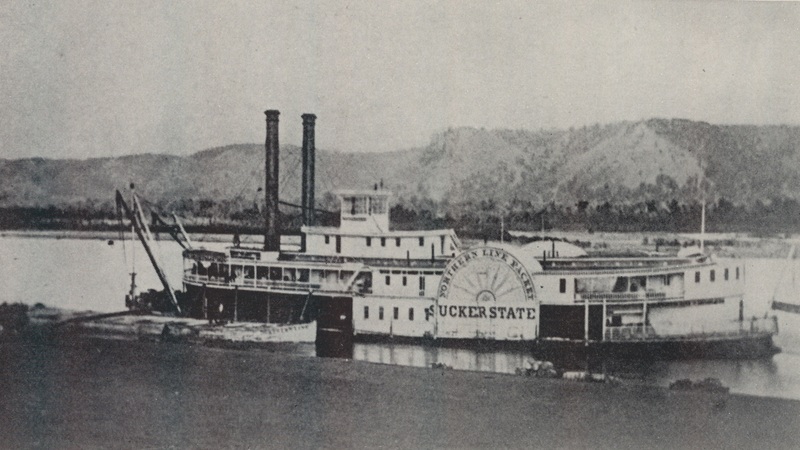 The Northern Line packet steamer Sucker State, which was christened with an old nickname of the state of Illinois, plied the waters of the Mississippi River from 1860 to 1872. One may be forgiven for supposing it has something to do with Illinois’ tradition of corrupt politics and government (a long history that our Illinois Bicentennial Series has shown to have begun in the days of the Illinois and Indiana territories). But no, that’s not the reason. But historians have made a few pretty interesting guesses, and one of their guesses seems to be most likely to be the right one. This guess has little to go for it, being unsupported by earlier historical witnesses. There’s no good reason to believe the nickname derives from the literal act of sucking water (something that is hardly unique or distinctive about Illinois’ pioneers). In this guess, then, it’s not Illinoisans sucking water, but Illinois miners being compared to migratory sucker fish. This guess is both earlier and more plausible than the above mentioned one. Even so, it may strike one as a bit too creative or strained – as if someone was trying a bit too hard to explain not only why Illinoisans were known as “Suckers,” but also why Illinoisans used the derogatory term “Pukes” for their neighbors in Missouri. In questions like these, the earliest known explanation is not always the correct one, but it usually is. For this particular question, the earliest explanation is that given by Illinois Gov. Thomas Ford in his 1854 “A History of Illinois.” Ford said the first settlers of southern Illinois came to be called “Suckers” as an analogy to the “suckers” (young sprouts and shoots) of the tobacco plant. It is probably no accident that both Ford and Chapman mention the mines at Galena – it seems that really is where the nickname “Sucker” was first given to Illinoisans. Ford’s explanation appears earlier than Chapman’s explanation, which makes Ford’s explanation more likely – but it cannot be held to be certainly true. As it happens, it was also by analogy that plant sprouts first came to be called “suckers.” The Online Etymology Dictionary says “sucker” is a Middle English word from the late 1300s meaning a young child who has not yet been weaned. By the 1570s the word had begun to be applied to plant shoots, since the shoots were like little “children” of the plant. Sucker fish aren’t mentioned in literature until 1753, and it wasn’t until 1836 that the American slang term “sucker,” meaning a fool, someone with childlike naïveté who is easily tricked, first appeared (and no, it was not in reference to Illinoisans). Whether the nickname derives from reed straws, fish, tobacco sprouts, or fools, the Illinois General Assembly in 1955 decided the state should instead be known as the “Land of Illinois,” voting to adopt that as our state’s official nickname. Today “Prairie State” is still sometimes heard, but “Sucker State” is rare, heard very little outside the circles of Illinois historical study. This is a reprint of a “From the Local History Room” column that first appeared in July 2013 before the launch of this weblog, republished here as a part of our Illinois Bicentennial Series on early Illinois history. We have recently recalled the story of the beginnings of permanent white settlement in Tazewell County. With the establishment of new settlements came the rudiments of governmental structures and civic life – and that means politics and formal elections. In addition to the story of his pioneer adventures, Dillon also wrote an account of the beginnings of civic institutions and elections in Tazewell County, and Chapman also incorporated that into his county history, on pages 711-712. Dillon said that the candidates, Kinney, Parkinson and Edwards “had a long bench ranged along side of the court-hose, on which they set their liquors. The polls were held in the interior. 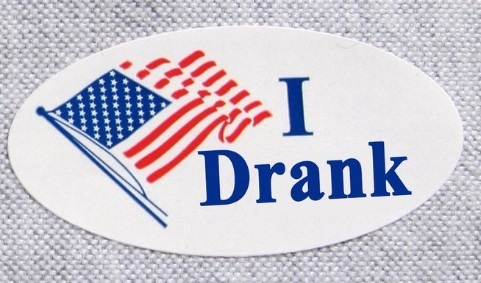 We all got plenty to drink . . . and a general frolic occurred; but what has surprised me as I have reflected upon these early days, we had no fighting. The great evil was, that every candidate had to fill his portmanteau with whisky, and go around and see and treat every voter and his wife and family with the poisonous stuff, or stand a chance of being defeated. . . .
“In the winter of 1823, I emigrated to what is now called Dillon Settlement, in this county, 10 miles from Pekin, and 17 miles from Peoria, where I spent the season in quietude; my nearest neighbor living in Peoria, except one by the name of Avery, who had raised his cabin at Funk’s Fill. But things did not remain in this condition long; for during the same winter the Legislature made a new county, with Peoria for the county-seat, embracing all the country north of Sangamon county. Phelps, Stephen French and myself were appointed Justices of the Pace, for the new county, which extended east as far as Bloomington and north and west to the State line. We sent our summonses to Chicago and Galena, and they were promptly returned by our constables. This is a revised version of a “From the Local History Room” column that first appeared in Aug. 2012 before the launch of this weblog, republished here as a part of our Illinois Bicentennial Series on early Illinois history. 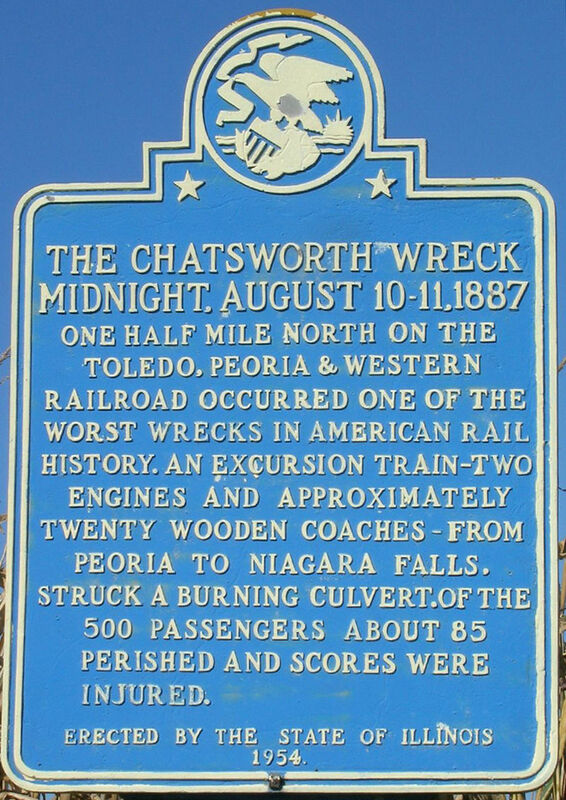 One of the worst railroad disasters in Illinois history was the Great Chatsworth Train Wreck of 1887. The disaster happened in Livingston County, not Tazewell County, so at first glance one might not think it was relevant to Tazewell County history. Nevertheless, the Pekin Public Library’s Local History Room has a file specifically on the Great Chatsworth Train Wreck. Notably, this photo was the basis for one of the engravings that illustrated the Harper’s Weekly account of the wreck in the issue dated Aug. 20, 1887. This photograph of the Great Chatsworth Train Wreck of 1887 was owned by the late Chris Ziebold of Pekin, and was used as the basis for an engraving that illustrated the Harper’s Weekly report on the wreck. 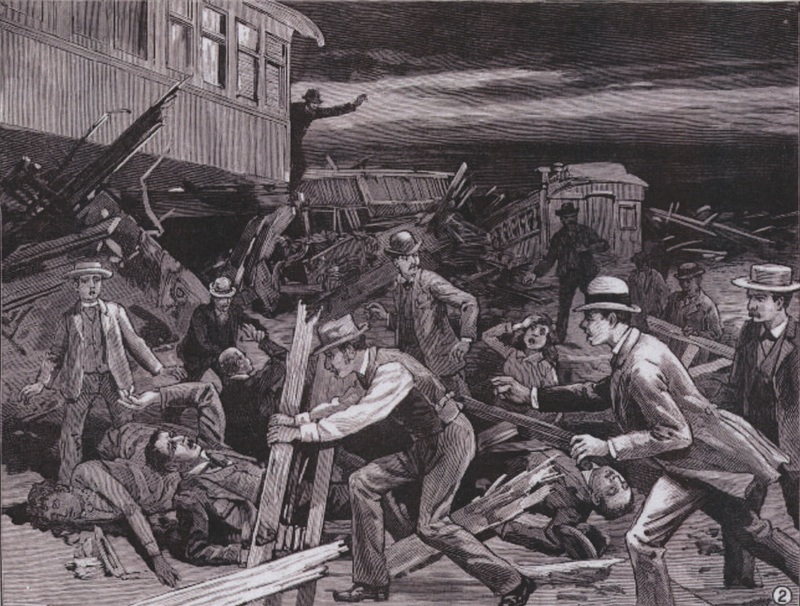 This Harper’s Weekly drawing illustrating its report of the Chatsworth train crash is clearly based on the above photograph. However, besides the local connection of the photograph, the disaster itself, in which at least 80 people died and probably hundreds were injured, touched the lives of many people throughout central Illinois. The train’s passengers no doubt included residents of Tazewell County. 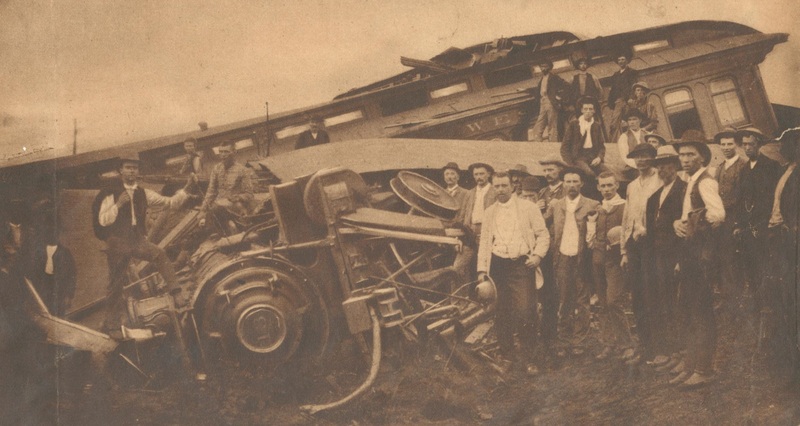 The wreck, which happened shortly before midnight on Aug. 10, 1887, has been ranked as either the second or third deadliest train disaster of the 19th century. The number of dead has been placed at between 81 and 85 (reports at the time estimated more than 100 dead) and the number of injured anywhere from 169 to 372. On the evening of Aug. 10, a Toledo, Peoria & Western train pulled out of Peoria, heading east through Eureka and Chenoa on the way to Niagara Falls. The train included two steam engines, six fully loaded passenger cars, six sleeper cars and three cars for luggage (and perhaps more cars). Aboard the train were as many as 700 people who had been attracted by a special offer to visit the famous falls on the New York/Canadian border. At a point about three miles east of Chatsworth, the train began to accelerate down a slope and reached a speed of about 40 mph. At this point the train began to cross a wooden trestle bridge over a creek. The first engine made it over the bridge, which then collapsed behind it, causing the second engine to slam into a hill side. Most of the cars behind the engine telescoped into the second engine and each other. Rescuers and searchers comb the Chatsworth train wreckage in this Harper’s Weekly drawing. News of the wreck quickly spread by telegraph. Hundreds, perhaps thousands, of onlookers descended on the scene, and many of them claimed “souvenirs” or even robbed the dead. That led to erroneous speculation that the bridge had been sabotaged for the purpose of robbing the train. In fact, however, it was a tragedy caused indirectly by the weather. The summer of 1887 was a drought year in central Illinois. Worried that sparks from their steam engines could start an uncontrollable brush fire, on the day of the wreck the TP&W Railroad conducted a controlled burn near the bridge. Apparently the fire was not completely extinguished, and the flames severely charred the wooden trestle under the bridge, leaving it unable to support the train’s weight. Four days later, the TP&W gathered the debris into a massive heap and set it on fire, even though it is very likely that not all the dead had been recovered from the wreckage. The burning of the wreck is the reason for the uncertain tallies of the dead and injured or even the exact number of cars in some reports. 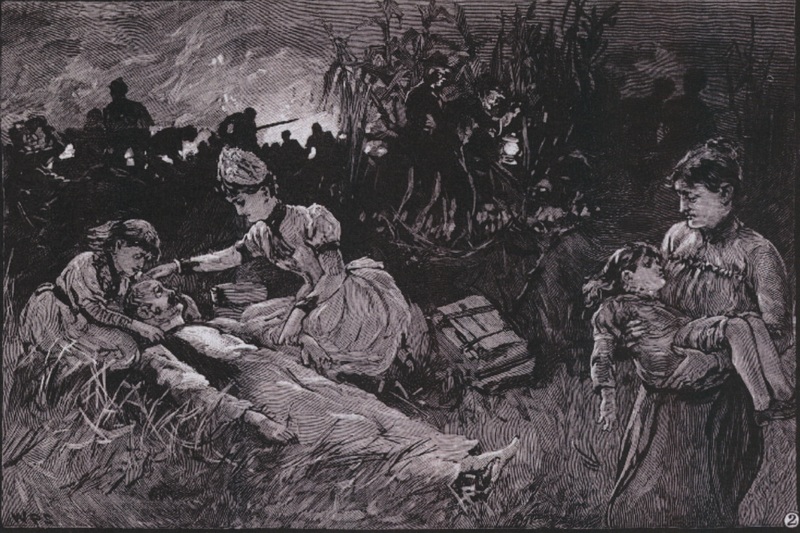 Survivors attend their dead loved ones at the scene of the Chatsworth train wreck in this Harper’s Weekly drawing. In the aftermath of the wreck, railroads shifted away from wooden passenger cars in favor of safer and sturdier steel. Also, not long after, musician Thomas P. Westendorf penned the folk ballad, “The Bridge Was Burned at Chatsworth” (also known as “The Chatsworth Wreck”), which was sung at a 1937 memorial service. A state historical marker was placed near the wreck site in 1954. This is a revised version of a “From the Local History Room” column that first appeared in Sept. 2011 before the launch of this weblog, under the title “Pekin Fire Department has a blazing history,” republished here as a part of our Illinois Bicentennial Series on early Illinois history. The Pekin Public Library’s Illinois Bicentennial video series continues next Friday, Nov. 2, with the showing of a video with a topic perhaps fitting for the season of Hallowe’en and All Souls Day: on-the-scene footage of the archaeological excavation of the former Tharp Pioneer Cemetery that used to be located at the site of the Pekin Schnucks grocery store. In the 1980s the old Douglas School building was torn down and replaced by K’s Super Saver (now Schnucks), and during construction human remains were discovered that had been overlooked when the former cemetery was closed and its burials transferred to Lakeside Cemetery. The video is about 70 minutes in length, and will be shown at 11 a.m. in the library’s Community Room. Earlier this month we recalled the Great Fire of 1860 which sparked the formation of Pekin’s original volunteer fire companies. This week we will take a further look at the early days of Pekin’s fire companies and municipal fire department. This photograph from the May 15, 1921 Peoria Journal-Transcript shows Pekin’s municipal fire house and trucks. 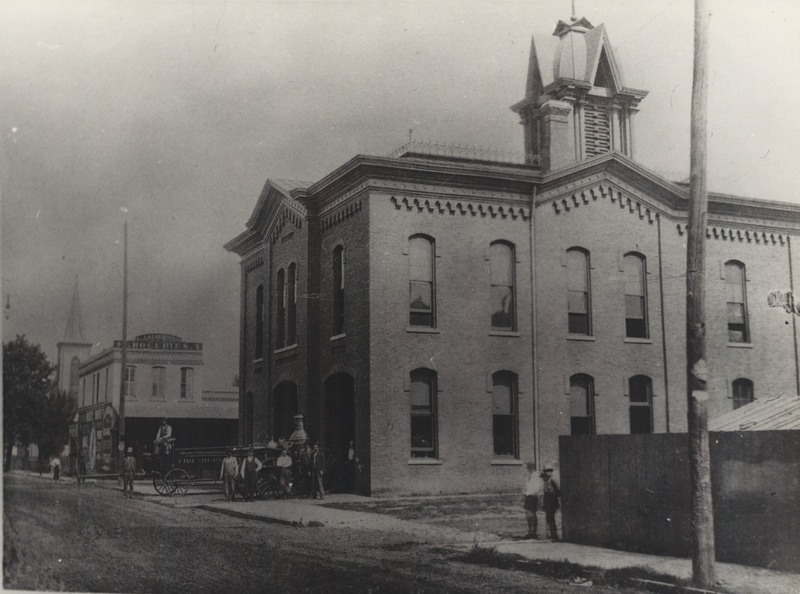 In those days the Pekin Fire Department was based in the old City Hall building at the corner of Fourth and Margaret streets. Another vintage photograph from the latter 1800s shows Pekin’s old City Hall building and fire house at the corner of Fourth and Margaret streets, with firemen posing with their horse-drawn equipment. 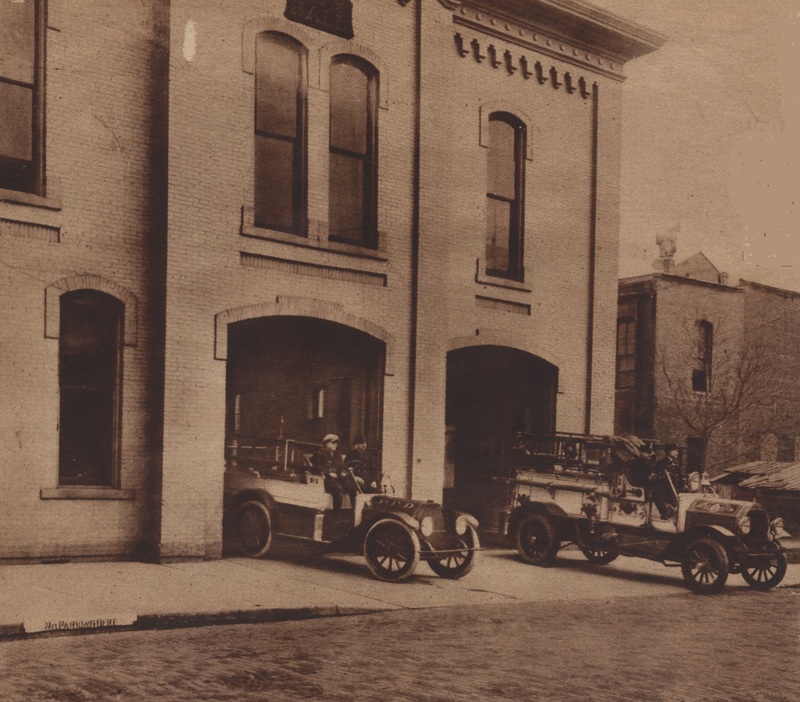 As we saw previously, in the aftermath of the Great Fire, three independent fire companies were formed: the Independent Hood and Ladder Company No. 1, Rescue Company No. 1, and Defiance Hose Company. In 1880 two more volunteer companies were organized: the “Wide Awake” and “Protection.” By 1894 the “Wide Awakes” had a partially paid department. Fire stations were built and torn down as they became obsolete. Equipment was purchased and modernized. 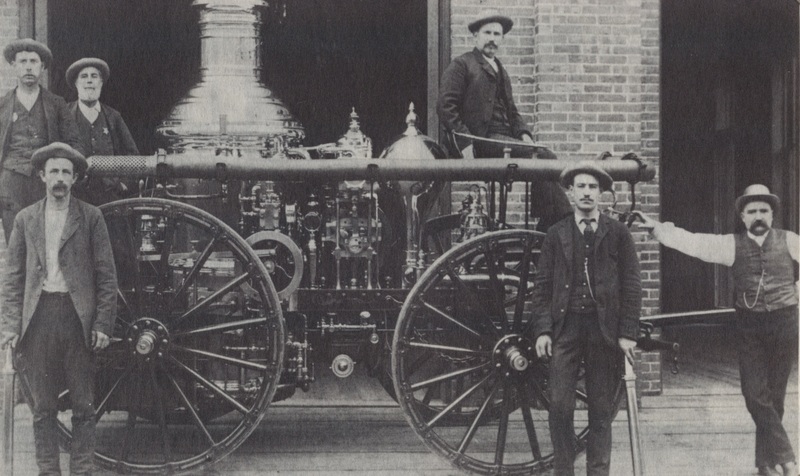 Pekin fire company volunteers show off their 1884 Ahrends “Eagle” steam pumper, a horse-drawn fire-fighting machine. In those days fire-fighting machinery was brought to the fires on horse-drawn wagons. But with the advent of the automobile toward the end of the 19th century, before long the days of horse-drawn fire wagons were at an end. By the early 1920s Pekin’s fire department had converted to automotive ladder trucks and pumper trucks. But how did the public get word to Pekin’s early fire companies that they were needed to put out a fire? Our modern “9-1-1” emergency system is obviously much faster and more efficient. Pekin firemen test the hoses on the fire departments new $13,000 fire truck in this Jan. 29, 1928 Peoria Journal-Transcript photograph. This is a revised version of a “From the Local History Room” column that first appeared in May 2013 before the launch of this weblog, republished here as a part of our Illinois Bicentennial Series on early Illinois history. The occasion of the Illinois Bicentennial is an ideal time to recall that Pekin’s hospital celebrated its own centennial just a little over five years ago. 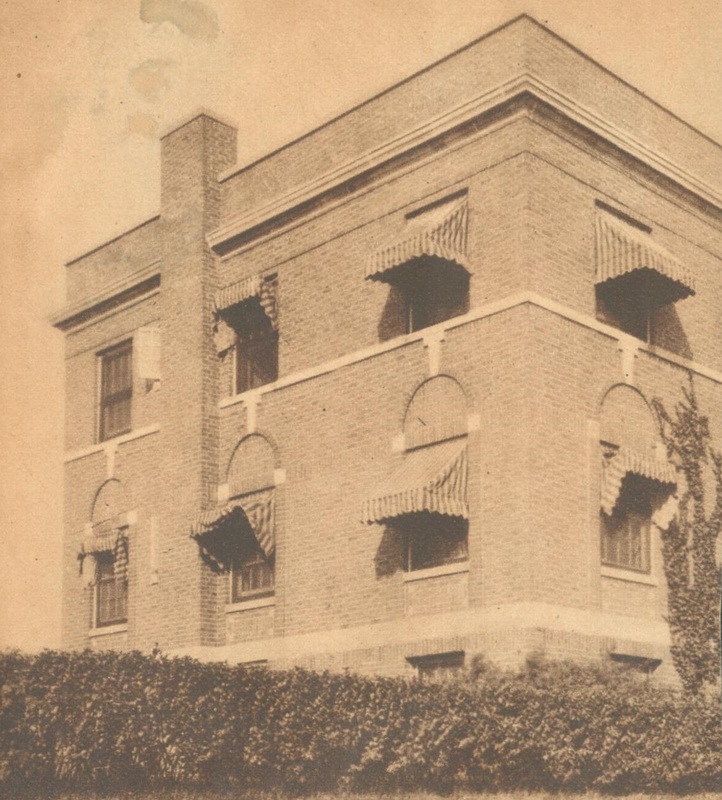 The history of this hospital – redubbed by its current corporate owners as “UnityPoint Health-Pekin” – began in 1913, when the community’s need for a public hospital led to the formation of a non-profit Pekin hospital corporation. That is not the year Pekin Hospital opened its doors, however. 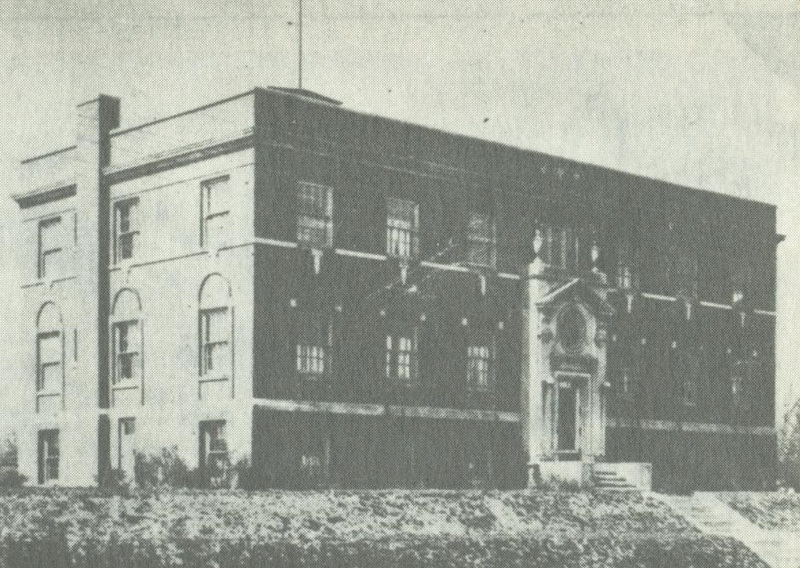 Rather, that year the hospital’s board, headed by Presidents G. A. Kuhl and J. M. Rahn, commenced fundraising campaigns to raise money for the construction of a hospital. Those efforts enabled the construction of a hospital building in 1918, which therefore would be 100 years old if it still existed. 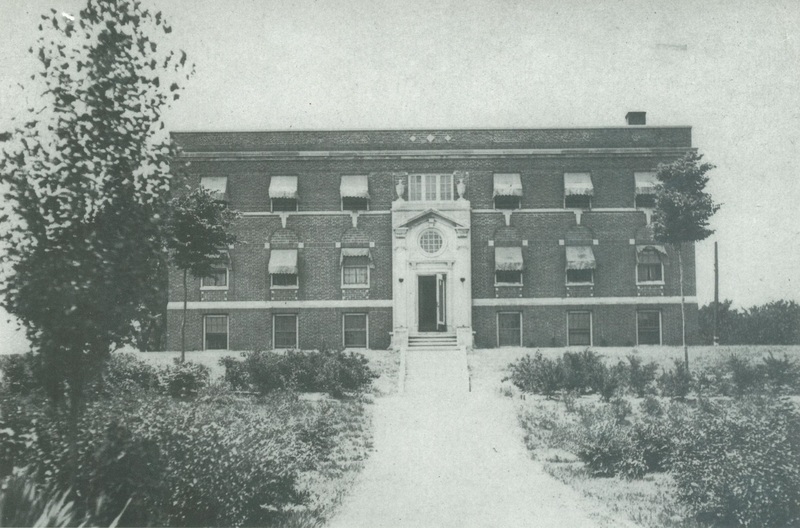 Shown is the original Pekin Hospital, built in 1918, photographed in 1928 from a path in the Sunken Gardens. Eventually this structure was torn down, but the main entrance was salvaged and is now attached to the north side of the 1931-2 addition, beneath a large clock. The original hospital as seen from Park Avenue and 14th Street. A closeup of the south end of the original Pekin Public Hospital building as seen from the area of 14th Street and Park Avenue about 1938. Built by Ed F. Lampitt & Sons building contractors, the 1918 facility was erected on 14th Street between Court Street and Park Avenue on land donated by three Ehrlicher brothers and their wives, George Jr. and Mary, Henry and Amelia, and Otto D. and Minnie. (Henry and Otto were Pekin’s first pharmacists.) It should be noted that “Pekin: A Pictorial History” (1998, 2004), p.142, mistakenly substitutes the surname of “Herget” for George Jr.’s real surname. The new edifice was formally dedicated Sunday afternoon, June 2, 1918, in ceremonies that were attended by a crowd of about 5,000. In its front page story on June 3, 1918, the Pekin Daily Times estimated that about 10,000 people toured the newly opened hospital that day. 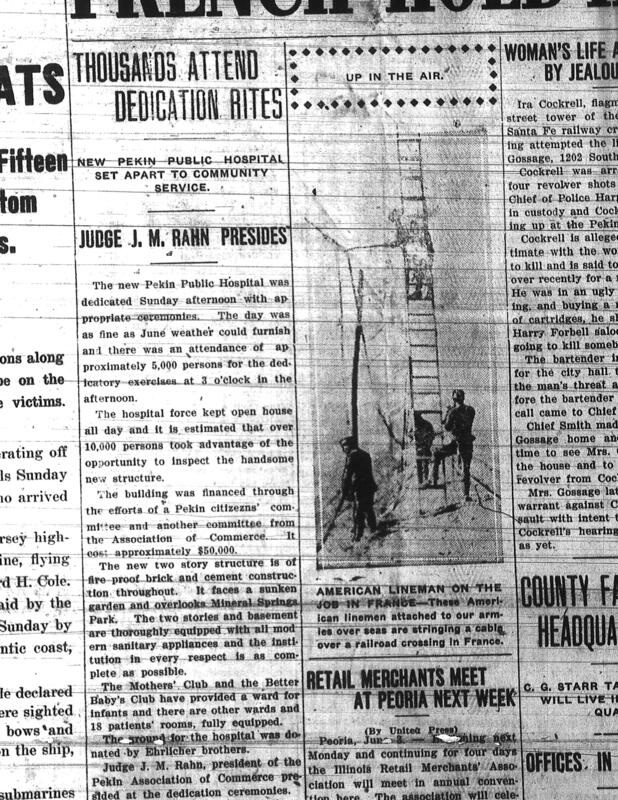 This detail from the front page of the 3 June 1918 Pekin Daily Times shows the first part of the story about the formal dedication of Pekin’s new hospital. Whatever the correct figure was, within a few years the need was evident for a larger hospital. “In 1931, a $150,000 fundraising drive (no small feat during a depression) resulted in additional construction and remodeling which boosted the capacity to 75 beds. This portion of the hospital is on Park Avenue, and for many years the main entrance was from that street,” says the 1974 Sesquicentennial. Pekin Public Hospital in a view looking across Park Avenue, from the 1949 “Pekin Centenary” volume. As Pekin continued to grow, Pekin Public Hospital again had to be expanded. 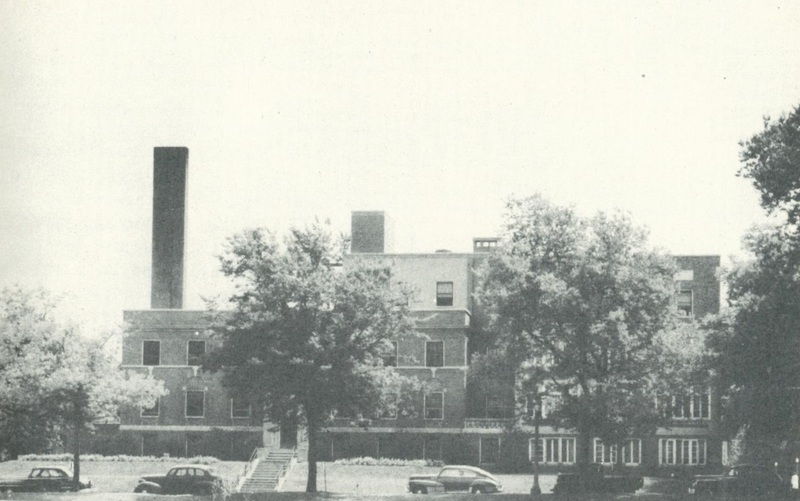 In the early 1950s, $750,000 was raised locally and was matched by a federal grant, enabling the construction of a six-story $1.5 million addition on Park Avenue that increased the hospital’s capacity to 150 beds. The expansion was formally dedicated on June 19, 1955. 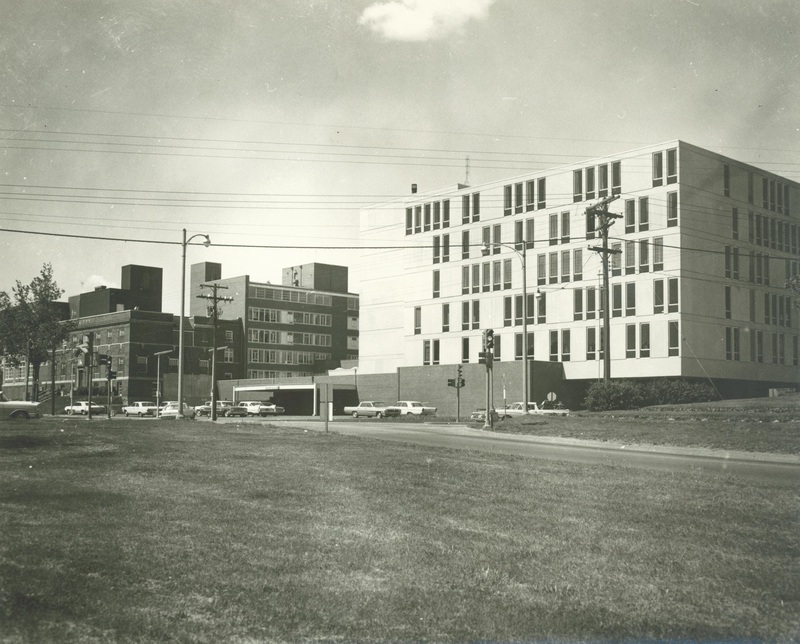 Pekin Memorial Hospital as photographed in 1966 by Ralph James Goodwin. Note that the original hospital building is still there, though wood paneling covers the north wall indicating construction work under way. The old building was torn down subsequently, but its entrance was salvaged and later installed on the north wall of the Park Avenue addition. It was in 1976 that those additional two stories were built, housing intensive and coronary care as well as obstetrics and pediatrics. Then, from 1979 to 1981, areas of the 1932 and 1954 additions were renovated to make room for pharmacy, medical records, a medical library, electrocardiography, respiratory therapy and radiology. On June 23, 1985, ground was broken on a $10.1 million addition that would include surgery and radiology as well as a lobby, pharmacy, gift shop, restaurant and Park Court Medical Center. The building program moved the main entrance from Court Street to 13th Street, where it is today. In Jan. 2018, Pekin Hospital completed the process of affiliation with Des Moines, Iowa-based UnityPoint Health, joining a system that now includes Methodist Medical Center (“UnityPoint Health-Methodist”) and Proctor Hospital (“UnityPoint Health-Proctor”) in Peoria. A year later a state-of-the-art Pekin physicians center opened at Griffin and Veterans Drive on Pekin’s east end – a building project initiated by Pekin Hospital in 2015, before the hospital affiliated with UnityPoint Health.